Emma Watson has addressed the grammar mistake in her Oscars tattoo. Fans were quick to notice the typo on the actress’ arm, as she posed for pictures at the Vanity Fair Oscars after-party on Sunday. Flaunting a new piece of ‘ink’ in honour of the movement, the tattoo read: “Times Up” (instead of “Time’s Up”). The Beauty and the Beast actress also revealed the tattoo wasn’t the real deal, but rather a temporary, transfer tattoo. Emma Watson debuted the new tattoo at the 2018 Oscars in order to show solidarity with the Time’s Up movement, resisting sexual assault, harassment and inequality in the workplace. The Time’s Up and #MeToo movements were a focal point of the ceremony, with Time’s Up pioneers Ashley Judd, Annabella Sciorra and Salma Hayek presenting together and Best Actress winner Frances McDormand asking female nominees to stand up and tell their own stories, as well as demand an inclusion rider in their contracts. During her acceptance speech, she said: “If I may be so honoured, can we have all the female nominees in all the categories stand with me. An inclusion rider is a clause in an actor’s contract, requiring the cast and crew be diverse in order to retain the actor, so for McDormand to say this on a global stage was hugely significant for the movement. 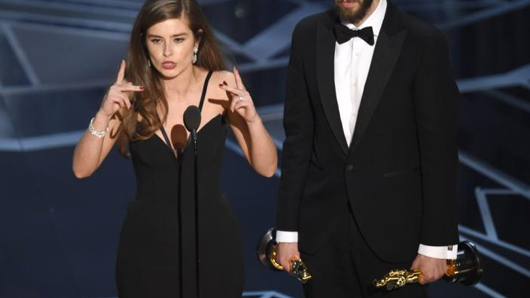 Former Hollyoaks star Rachel Shenton has given her Oscars acceptance speech in sign language. The actress, who played wannabe WAG and Cheryl Cole lookalike Mitzeee Minniver between 2010-13, accepted the Best Live Action Short Film award in Hollywood last night. Shenton accepted the award alongside director boyfriend Chris Overton, who she met through Hollyoaks. Their film ‘The Silent Child’ is about the difficulties faced by a deaf child in an able-bodied family. She told the crowd that she had promised her six-year-old co-star Maisie Sly to give her acceptance speech in sign language. Shenton said: “I made a promise to our six-year-old lead actress that I would sign this speech but my hands are shaking a little bit, so I apologise. “Our movie is about a deaf child being born into a world of silence, it’s not exaggerated or sensationalised for the movie, this is happening, millions of children all over the world live in silence and face communication barriers and access to education. Last year’s Academy Awards were a tough one to beat in terms of comedy material, what with the infamous winner mix-up and Nicole Kidman’s iconic seal clap going down in Oscars history. 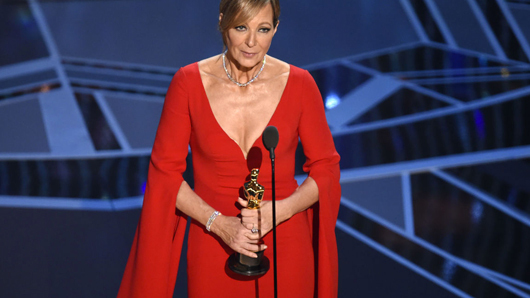 However, you’ll be pleased to hear that there was still plenty for Twitter to work with during last night’s ceremony, as Allison Janney’s “I did this all by myself” speech, Jennifer Garner’s horrified expression and Armie Hammer bursting into an unsuspecting cinema with a hotdog cannon were responsible for some of this year’s most hilarious GIFs, memes and punchlines. I have two words to leave you with tonight: Hotdog. Cannon. The Shape of Water scored the most gongs at the 90th Academy Awards, held last night in Hollywood. The Guillermo Del Toro-directed fantasy won four Oscars, including the coveted Best Picture and Best Director awards. Three Billboards Outside Ebbing, Missouri star Frances McDormand used her Best Actress speech to ask film executives for greater female inclusion in their projects. Meanwhile, Best Actor winner Gary Oldman thanked his 98-year-old mother for his first Oscar win and asked if she would put the kettle on for his trip home. Oscars 2018 Predictions: Who will win Best Actor and Actress? 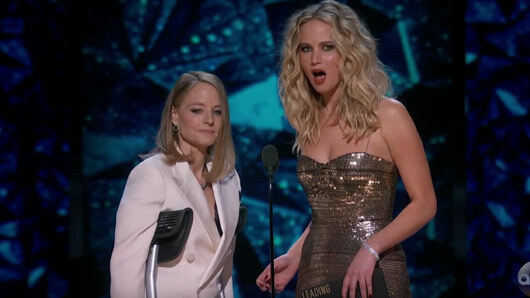 The biggest night in Hollywood is tonight, but who will win the biggest gongs in acting? Nominated for Best Actor are Timothée Chalamet for Call Me By Your Name, Daniel Day-Lewis for Phantom Thread, Daniel Kaluuya for Get Out, Gary Oldman for Darkest Hour and Denzel Washington for Roman J. Israel, Esq. It’s a very strong category this year, even if our predicted winner is completely unrecognisable in the film for which he’s nominated! That’s right, we’re putting our bets on Gary Oldman to take home the Oscar for his breathtaking transformation into British wartime Prime Minister Winston Churchill for Darkest Hour. With the help of astonishingly realistic prosthetics, the slight Oldman was transformed into Britain’s most famous Prime Minister – and then performed the role to critical acclaim. 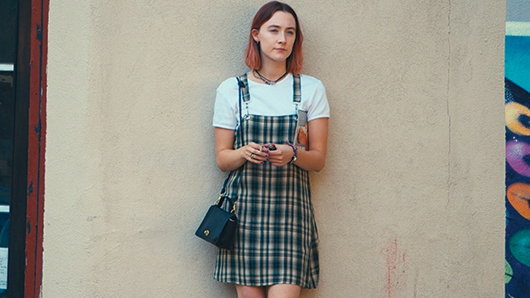 Meanwhile, for Best Actress we’ve got Sally Hawkins for The Shape of Water, Frances McDormand for Three Billboards Outside Ebbing, Missouri, Meryl Streep for The Post, Margot Robbie for I, Tonya and Saoirse Ronan for Lady Bird. Three Billboards Outside Ebbing, Missouri looks set to sweep the awards, with the most nominations in 2018 (a whopping 13). The Best Actress category is no exception to this, with our bets on Frances McDormand taking home the prize. In the black comedy, McDormand plays a grieving mother who will go to any lengths to seek justice for her murdered daughter. As the Golden Globe winner of the award, she’s definitely our hot favourite. The Oscars will be live on Sky Cinema Oscars and NOW TV from midnight, March 5. Oscars 2018: Where can I watch the Academy Awards in the UK? The biggest weekend in film is finally here. After being delayed due to the 2018 Winter Olympics, Hollywood’s hottest night of the year will take place this Sunday, March 4. The ceremony will take place at the Dolby Theatre at Hollywood & Highland Centre in Los Angeles. American talk show host Jimmy Kimmel will host the ceremony, which many big stars are expected to attend. Guillermo del Toro’s fantasy The Shape of Water looks most likely to take home the gongs, with an impressive 13 nominations – including Best Picture. Meanwhile Dunkirk has eight and crime drama Three Billboards Outside Ebbing, Missouri has seven. Timothee Chalamet, Daniel Day-Lewis, Daniel Kaluuya, Gary Oldman and Denzel Washington will compete for the Best Actor accolade. Meanwhile, Sally Hawkins, Frances McDormand, Margot Robbie, Saoirse Ronan and Meryl Streep are all in the mix for Best Actress. 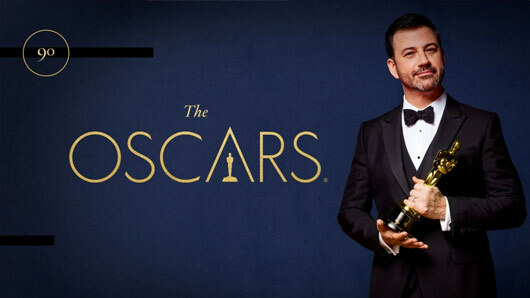 The Oscars will be streamed live on Sky Cinema Oscars, available to Sky Movies subscribers – or to NOW TV users with the Sky Cinema Pass (£9.99 a month). The ceremony takes place at 8.30pm local time, while coverage in the UK will begin at midnight. The nominations for the 2018 Oscars have been announced. Guillermo del Toro’s fantasy The Shape of Water leads the race, with 13 nominations – including Best Picture – to its name. Meanwhile, the Chris Nolan World War II epic Dunkirk has eight while crime drama Three Billboards Outside Ebbing, Missouri has seven. Fighting for the Best Actor gong are Timothee Chalamet, Daniel Day-Lewis, Daniel Kaluuya, Gary Oldman and Denzel Washington. Best Actress nominees comprise Sally Hawkins, Frances McDormand, Margot Robbie, Saoirse Ronan and Meryl Streep. The ceremony announcing the winners will take place on March 4 in Hollywood. Jimmy Kimmel is due to host the event. The 90th Academy Awards ceremony will take place on March 4 in Hollywood.